SawStop Table Saw Reviews: See How This One-Of-A-Kind Saw Stop Is Saving Thousands Of Fingers! 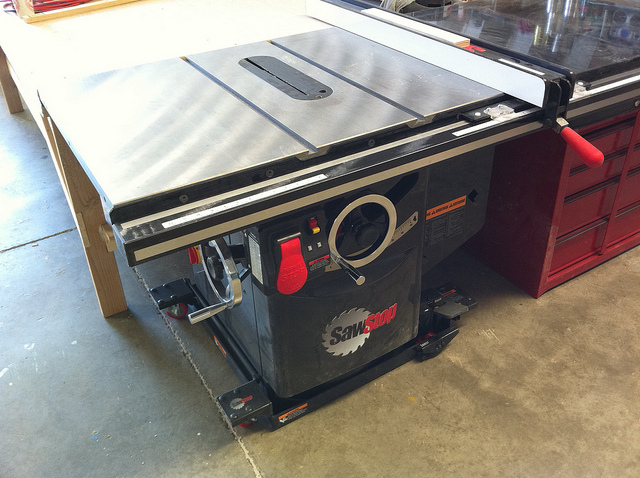 There is a table saw (or cabinet saw) on the market that is revolutionizing the industry. Because it has a finger-saving technology that is amazing and ingenious. You may not have heard of it before, but it is the table saw that all (single-digit) shop teachers should’ve had all along. When I first heard about the SawStop table saw from a friend of mine, and then watched the video of how it works (a.k.a. the hot dog test), I felt compelled to spread the word in the name of safe woodworking in the homebuilding industry, and for homeowners alike. As mentioned by the SawStop’s inventor Steve Gass in this video, there are about 60,000 medically treated hand saw accidents every year. About 3,000 people cut their fingers off; that’s about 10 a day. Incredibly, the SawStop can tell the difference between your finger and the wood. That means no more severed fingers from using table saws! I do not own a table saw or cabinet saw, but if I did, this would definitely be my pick. It’s a no-brainer, although it is expensive. I am not a dealer, nor am I endorsing this product. I just think it’s just a brilliant invention that will save thousands upon thousands of fingers from being sawed off. The blade carries an electrical signal that is continuously monitored by the safety system. When the blade makes contact with your skin, the aluminum brake engages the rotating blade, stops it immediately, and the momentum from the blade causes it to drop below the surface of the table. The aluminum brake cartridge acts much like a crumple zone in cars. The g-force exerted by the 5,000 rpm blade is tremendous, but the crumple zone is able to absorb the crushing blow. If the device is activated, it destroys the replaceable brake cartridge device and the blade. A new brake cartridge will set you back $70 to $90, and a new blade costs between $30 and $90. That seems a small price to pay to keep all of your fingers where they were meant to be… on your hands. Of course, those are just a few. 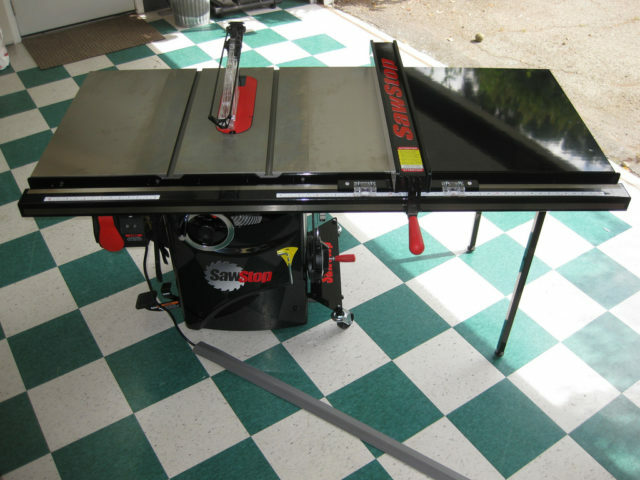 Each of the above SawStop reviews shows photos and/or video demonstrations. The above reviews are positive, and these guys didn’t hold back — so be sure and check them out. This Lumberjocks review, in particular, has some great photos of the unit they purchased with some great custom built fences and wing extensions. To prove that the SawStop actually works as described, the inventor — Steve Gass — even put his own finger on the line! I mentioned a hot dog test earlier. There are numerous videos out there that show a hot dog (representing the same properties as skin) being pushed toward the saw blade. It’s pretty awesome to watch. The hot dog is kind of silly, but seeing the blade stop in 3-5 milliseconds is quite amazing. Think about it, the blade is spinning at or around 5,000 rpm — and a hot dog (or a finger) instantaneously stops the blade from spinning! The video below shows another SawStop hot dog test, but this time it’s followed by the inventor of the SawStop, Steve Gass, putting his own finger to the test. Needless to say, he still has 10 digits. The United States Consumer Protection Safety Commission (CPSC) supported a petition by SawStop requesting mandatory safety performance safety standards to reduce or prevent saw blade contact injuries. The CPSC has also awarded SawStop with a safety commendation. I can imagine this technology being used in other industrial-type devices to do the same thing.